Newspaper Rock: "Mail of Tears"
Gawker uses "Mail of Tears" for a cheap punThis, my friends, is a post about how the internet is a slow learner. 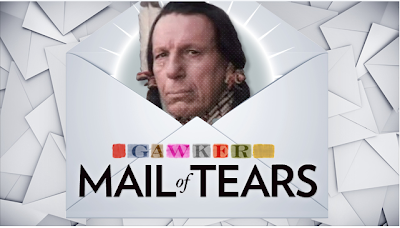 A few days ago Gawker writer Leah Beckmann posted a round-up of crappy reader mail, and in a clear lapse of judgment and lack of awareness of American history, or a blog in her own network's history, entitled it "Mail of Tears"--complete with a picture of Iron Eyes Cody (the Italian actor who played the "crying Indian" in that famous PSA). Longtime readers of the blog might think this sounds eerily familiar...and that's because in 2010, Jezebel (Gawker's "sister site") wrote about Meghan McCain crying and gave it the hashtag #trailoftears. I was, clearly and similarly, enraged.Comment: Would you make a pun about Auschwitz, Zyklon B, ovens, or the Holocaut? Perhaps with a picture of a Jew in prison garb? What's the difference between that and this, if anything? Using a fake Indian--because he's crying, presumably--only compounds the problem. It seems painfully obvious that Gawker thinks Indians aren't real people with feelings. For more on the subject, see Actual Indians Crying.